McWane. Your trusted provider of guaranteed American-made waterworks products. Click here to learn more about "Why Buy American?" 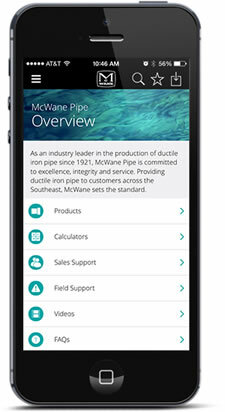 McWane employs more than 4,000 U.S. workers who safely and sustainably manufacture ductile iron pipe, soil pipe, fittings, hydrants, and valves in facilities here in the United States. Our products comprise the backbone of the vital water distribution and wastewater treatment systems throughout North America and dependably provide the U.S. with clean drinking water. McWane is committed to American workers and American industry. At a time when many of our competitors have moved their manufacturing operations overseas or elected to import foreign products at the expense of American jobs, McWane has invested hundreds of millions of dollars to modernize its U.S. plants and make them safe, efficient and compliant with the world’s most demanding regulatory regime. In doing so, it preserved thousands of well-paying American jobs and the futures of many communities. U.S. taxpayer dollars should not be used to reward those companies who have moved their operations, investment dollars, and jobs to foreign countries. Nor should they be used to purchase iron products cast in foreign foundries that completely disregard environmental and worker and workplace safety regulations. Rather, taxpayer-financed federal aid programs – particularly those administered by the federal agency charged with protecting the environment – should give a commonsense preference for American manufactured products in infrastructure projects. Such preferences ensure that companies and workers who play by the rules can compete on a more even playing field to supply these taxpayer-financed infrastructure projects. Buying American means reinvesting U.S. tax dollars in the U.S. economy and with U.S. taxpayers. Buying American means preserving and creating jobs here in the United States. Buying American is good public policy and simply the right thing to do. If you have specific questions, or can’t find the information you’re seeking, we encourage you to contact us. If this issue is important to you, please contact your member of congress. Watch our video to see the importance of American jobs and industry!